Learn more in this interview with Cindy Goodman Stulberg and Ronald Frey, authors of Feeling Better. For years, the first line of defence for depression has been pharmaceuticals, but in their new book Feeling Better: Beat Depression and Improve Your Relationships with Interpersonal Psychotherapy (New World Library, November 20, 2018), psychologists and authors Cindy Goodman Stulberg and Ronald J. Frey, PhD, say that it is actually our relationships that offer the most effective path to healing. Knowing that depression is an illness as legitimate as any physical ailment, Feeling Better helps readers get clarity around the four main areas in life that can be contributing factors to why people feel sad, blue, down, and depressed: life transitions, complicated grief, interpersonal conflict, or social isolation. We hope you’ll enjoy this short interview with Cindy and Ron about the book. You encourage readers to think of their depression like a broken leg. Why is that? Unfortunately, there is still a lot of negative stigma surrounding mental health in our society. People accept this and blame themselves or feel ashamed if they are depressed. Many suffer in silence. By viewing depression as a medical illness (like pneumonia or a broken leg) people are more inclined to ask for help and to take some time off from responsibilities so they can focus on optimizing their interpersonal relationships. Additionally, as others begin to see mental illness similar to a physical illness, they will provide care, support and compassion for those suffering. 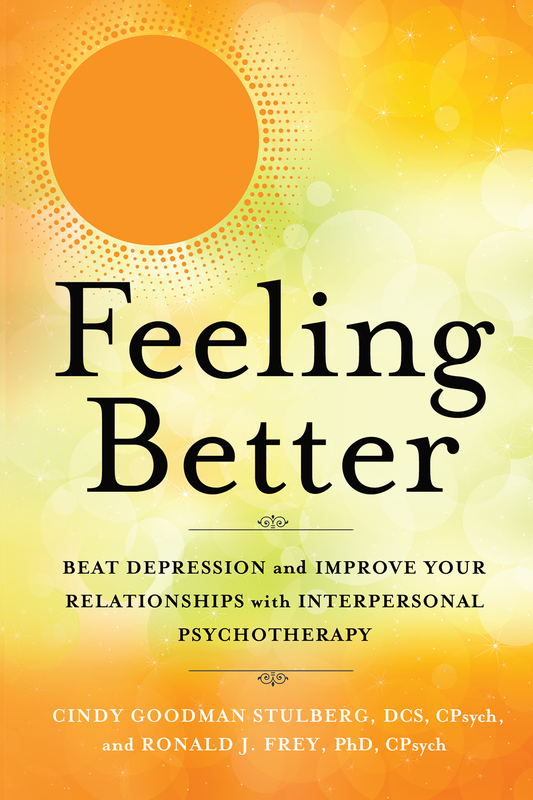 Your book Feeling Better offers an introduction to Interpersonal Psychotherapy (IPT). What is IPT exactly? IPT is a short-term, research proven therapy that usually lasts 8-12 weeks. It helps clients improve their relationships, which then improves their mood. It provides a new set of skills you can use to conquer depression and it can help prevent future episodes. Two doctors created the model in the 1960s to treat adults with depression and has been adapted for the treatment of adolescents and older adults as well. IPT can be used in individual or group settings to treat classic depression and related illnesses like chronic depression, postpartum depression, eating disorders, and more. IPT focuses on what is happening currently, not on the past. It is based on the premise that building meaningful and constructive relationships will help you feel better. It is structured and collaborative and helps clients articulate and deal with their feelings in a constructive and interpersonal way. Most importantly, it helps clients become aware of the impact their social and intimate interactions have on their feelings and on the feeling of the individuals they interact with. You say in the book that there are four different problem areas in our lives that contribute to depression. Please tell us what they are. People who are experiencing conflicts or disputes, life transitions (like a divorce, birth of a child, job loss), unresolved bereavement, or feelings of loneliness and isolation, are at risk for becoming depressed. IPT uses these four areas to focus the therapy sessions and to create achievable goals. The approach creates a very focused collaborative approach that ensures that individuals will feel better faster. You say in the book that working through feelings is a lot like sorting through the stuff you’ve stored in a messy basement. Tell us more. You may not know everything that you have stored down in your basement. While sorting through all your stuff, you could choose to just throw everything away to avoid any potentially painful memories from surfacing. Alternatively, you could sit in a chair and carefully look through what is in all those boxes and experience a ‘mixed bag of emotions’ all alone. IPT offers a different and ultimately more rewarding approach of going through the piles of boxes with a friend. You’ll likely experience some tears, some laughter, some anger, and some frustration but experiencing these feeling with someone else is infinitely healthier than experiencing them alone. Cindy Goodman Stulberg, DCS, CPsych, and Ronald J. Frey, PhD, CPsych, are the authors of Feeling Better and directors of the Institute for Interpersonal Psychotherapy. Visit them online at http://interpersonalpsychotherapy.com.